Earlier this week, China's State Council sneakily released a document about regulations in the nifty Shanghai Free Trade Zone. Due to this release, media outlets have been calling China's archaic 13-year ban on video games consoles to be over. I'm here to rain on everyone's parade. The new official document released on Monday by the Chinese State Council is dated December 21 of last year and says that the State Council is looking to expand and promote industries—industries such as games. In the document, the State Council, the center of the government's power, writes that games, game consoles and services will be allowed into China. It doesn't explain how and when this will happen. This is the same as what Kotaku reported back in September. This has not changed, and it's something that The Wall Street Journal also pointed out earlier today. Yet, people are excited! Nintendo stock shares are going up! But for what, really? Here is where things get convoluted. The recently released document references regulations proposed in September and suspends the "console ban" that was put in in 2000. Meaning? It's suspending a ban that was already technically lifted by provisions from September. This new document does not say when or how the new regulations will go into effect. Here is the subsection dealing with video games. It's basically a temporary lift on the ban that was essentially already lifted. Yay! The ban is lifted...but wait...it's only temporary, and the State Council doesn't get anymore clearer than that previous regulations that banned consoles are suspended. This document, the same with previous document is all bureaucratic jargon that doesn't make any real promises. The wording in the document is totally ambiguous as to what the future of the regulations will be. This is not a complete out right lift of the ban but rather a temporary lift. 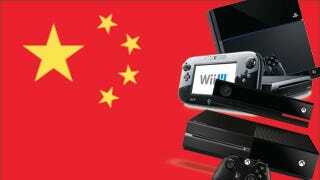 Last September we reported that China's console ban was lifted. In July, the Chinese State Council created the Shanghai Free Trade Zone. This new FTZ is meant to create new jobs and "open" China more to the rest of the world. In September, the State Council released a document detailing the regulations of the FTZ, and video games were listed on the document. Video games, games consoles, game paraphernalia and services provided and made in the FTZ could be allowed to spread into the Chinese mainland. But the "cherry" on this sundae is that all content geared towards the Chinese mainland still needed to be inspected and approved by relevant ministries, in this case, the Ministry of Culture. Kotaku reported this last September. This has not changed. Consoles in China were banned in the year 2000. Apparently, they were banned to "protect" children. Even with the ban, consoles have been by no means hard to get. They are readily available in China's quasi-illegal gray markets. For years, games and the like have been available to anyone who really wanted them. I can go out now, with about the Chinese equivalent of $600 and purchase a Hong Kong region PlayStation 4 if I wanted to. I won't be locked up and no one will stop me. On top of that, Nintendo is technically already in China via the iQue brand. Once again, this latest release still doesn't provide clarification on over how consoles will be allowed in China and when they will be. How will the Ministry of Culture handle inspections and approvals? What about the games? What's the point of having consoles if the games never make it pass the censors? There is still a long ways to go before consoles will be legally sold in China, and even then, it'll be a longer ways off before the games will find themselves in legally. Not that it really matters for people who really really want the stuff anyway. They've already got it.